The main purpose of SafelyFiled is for families to be able to store, organize and share very sensitive family documents and records. For that reason, we designed the service to be extremely secure. But it has so many other uses and is so affordable, that we thought we'd put together a list of other things we've heard our members do with it and some things we personally use it for. This is just the first part as there are so many uses we didn't want to overwhelm you in one blog. Even if you don't use SafelyFiled, we hope this list of things helps you to organize some paperwork you may not have thought of. For those of us who keep the maintenance records and purchase receipts for our vehicles in the glove box, that paperwork can become damaged and require a lot of sorting through to find exactly what we need. You can use your smart phone to photograph those documents and use our App to upload them into your account for quick access anytime. For these types of records, you can even email them into your SafelyFiled account as the info contained on these records isn't sensitive (usually). Now you can destroy the papers and have room to put gloves in the glove compartment! If you need paper copies when you sell or trade the car, just print them off for the new owner. We have a user who owns a farm. She has equipment that needs annual maintenance and safety checks. She uploads her documentation from the previous year's service and adds a reminder to them for next year so she doesn't have to worry about missing a required inspection. Have you ever needed to order some special equipment or replacement parts? I shop online often to order specialty pool replacement items like my pool light bulb. I don't need to replace it often, maybe every 5 years or so, so when I need to reorder, it's very handy to have the old order form so I have the correct part number and record of where I ordered it from. Yes, we realize you can save a lot of this information in other like services and even on your computer because they aren't necessarily sensitive in nature. But why have your information in different places? 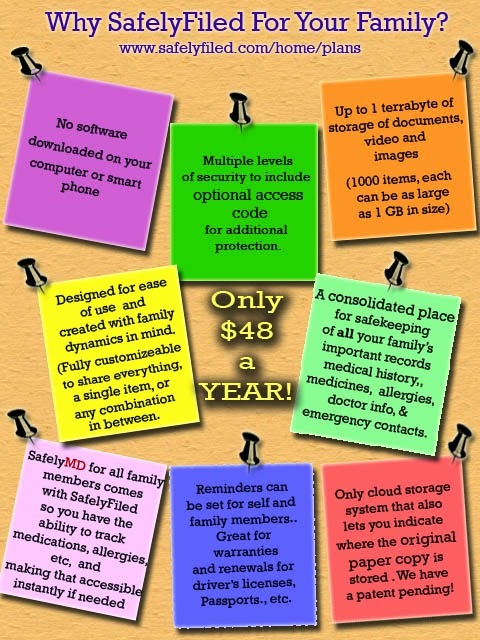 SafelyFiled gives you enough storage space to store everything in one place and it is very affordable. Medical Care Alert - Are You Prepared?